Piksters® are pleased to announce the world’s first bamboo interdental brush offering a sustainable option to plastic brushes. Whilst recognising that regular Piksters® use minimal plastic when compared to other interdental brushes, Piksters® can now offer an eco-friendly solution for consumers who are deeply concerned about the impact of plastics on the environment. New RIGHT ANGLE Bamboo Piksters® are 99% biodegradable. The handles are made from sustainably grown and fully biodegradable bamboo. All packaging is paper based and comes from 100% recycled and biodegradable materials. The protective cap and colour coded brush tip is made from PLA which is derived from cornstarch and is also 100% biodegradable. Even the printing inks are eco-safe soy based. It is only the high-quality brush and coated wire which is non-degradable (1%). No eco alternative brush assembly can achieve the same level of optimal cleaning, strength and safety as the Piksters® special coated stainless-steel wire and nylon bristles. delivers the perfect angle for interdental gaps around posterior teeth without the need to bend the wire. The easy-to-hold handle delivers excellent grip and cleaning without getting fingers in the mouth. 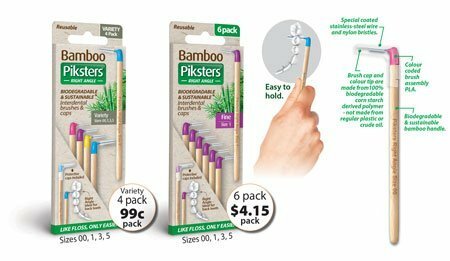 RIGHT ANGLE Bamboo Piksters® are available in sizes; 00, 1, 3, & 5 in packs of 6 and in a Variety Pack of 4 brushes, one each of size 00, 1, 3, and 5.